When the usage of drones (officially "unmanned combat aerial vehicles") for bombing and surveillance entered the national conversation during the latter years of the last century, the general reaction was positive. The argument was that, by using these aircraft, the lives of American pilots might be saved and more complete intelligence could be compiled about potential targets. Nearly a quarter century later, the debate has grown more complicated and heated. Andrew Niccol's Good Kill explores the moral landscape surrounding drone use, focusing not on the targets but on those who control the weaponry. One question in particular emerges from the none-to-subtle monologues: Is it more ethical to bomb while sitting in a secure location 7000 miles away than to attack from the cockpit of an aircraft flying overhead? Watching Good Kill, I was reminded of an old Star Trek episode called "A Taste of Armageddon." In that story, killing had become so regimented and antiseptic that mass death no longer held any horror. Niccol argues that something of the sort may be going on in today's world. Killing enemy combatants has become easy and painless with the gruesome consequences hidden away on the other side of the world - computer representations and images on a screen. Drone piloting isn't much different from playing a sophisticated video game. And, although the film's Lt. Col. Jack Johns (Bruce Greenwood) repeatedly emphasizes that the results of this "game" are real and irreversible (representing human lives lost not merely avatars scrubbed out), there's a sense that not all the drone pilots process this. Either they don't understand or don't care to. Unfortunately for Major Thomas Egan (Ethan Hawke), he is unable to lock away his conscience and simply obey orders. Egan, a decorated fighter pilot with six tours of duty behind him, has been reassigned to controlling drones over the Middle East and North Africa from a location outside Las Vegas. It's a job that, despite his qualifications, he is ill-suited for. His wife, Molly (January Jones), loves having him home but Egan misses the experience of being in a plane and views his current method of attacking as cowardly. He drinks to forget and is prone to volcanic bouts of temper. When a disembodied CIA voice known only as "Langley" (and provided by Peter Coyote) begins calling the shots - caring little about collateral damage as long as the mission is successful - Egan reaches his breaking point. Dating back nearly 20 years to his directorial debut in Gattaca, Niccol has shown interest in the dehumanizing implications of technological advances - a theme in play here. The screenplay's weakness, at least when it comes to an examination of the issues, is a kind of muddled ambivalence. The film never addresses the larger question of whether, in a combat situation, it might be better for drones to be on the front line rather than humans. Is it unethical to use technology to give one side an advantage in battle? The history of warfare is replete with instances of this - from the machine gun to the tank to the airplane. 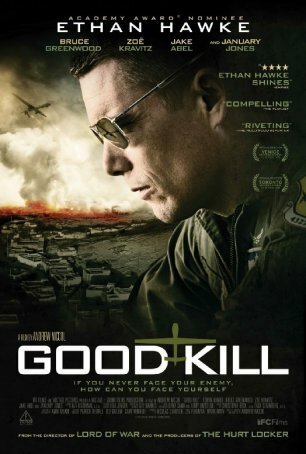 Good Kill excels as a character study with Niccol's screenplay making Egan a fascinatingly conflicted and flawed individual and Ethan Hawke giving one of his best recent performances bringing the man to life. The moral quandary facing Egan is only one facet of the issues besetting him. A deeper problem is that he feels trapped. Instead of flying free with the proverbial wind in his hair, he's forced to sit all day in a claustrophobic room then come home to a wife who watches and worries. Toward the end, when Egan makes two decisive choices, it seems more like an act of rebellion than an ethical statement. To an extent, it's both, but to Niccol and Hawke's credit, the motivations aren't italicized in black and white. The issues addressed in Good Kill exist firmly in the gray and that's where the character resides for the majority of the film.